Asabârân-î Haurâvatîsh are light horsemen hailing from Arachosia, Bactria and Sogdiana and best used in a harassing role due to their large supply of javelins. Historically; Armed chiefly with javelins these horsemen hail from Arachosia, Baktria, Sogdiana, and similarly equipped light cavalry was supplied by the levy from Persis and Media. 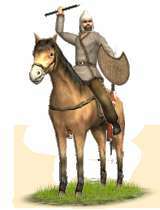 The flexible nature of this light cavalry makes them well suited to the fluid, aggressive style of warfare so common on the eastern frontiers. Mounted on a swift horse, armed with nothing but a small crescent shaped 'Taka' shield, short spear, and a handful of javelins these swift moving horsemen can be deadly. Their small, nimble mountain ponies can negotiate most terrain easily, and they're capable enough to survive contact with the enemy, but their strength remains in maintaining their loose style of fighting. Equipped with javelins these cavalry would advance on their target at less than a gallop. As each rank came into range, these warriors would turn away, hurling their javelins at the target, and retire to safety before the enemy could retaliate. The result is often a swirling mass of charging and counter charging horsemen as the light horse would reform to charge again.